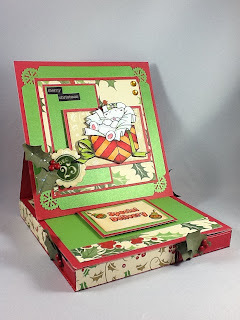 In case you stopped by to see scrappy stuff, I made a card for the November "Favorite Colors" challenge at Crafter's Companion and I thought I would share it with you. I'm not really sure if it qualifies as "favorite colors" because it seems pretty colorful. But my thought was that the two main colors were pink and green and those two colors are working for me right now. (update) For some reason blogger isn't wanting to let me upload photos and I don't have time to worry about it before I leave so you will just have to wait until I get back to see my project. Thanks for stopping by to see me today. Special Delivery From Me to You! I want to start with a question. Do you have the Ultimate Advanced Construction Techniques DVD? I have to admit that I have it and I adore it! Whenever I want to make something a little extra special I pull it out and get to work. That is what I have done today. Here is the set of drawers card I made to share with you. 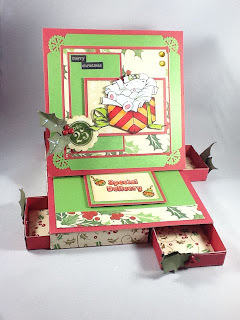 I started by pulling out my Strawberry Kisses - Special Delivery stamp set. 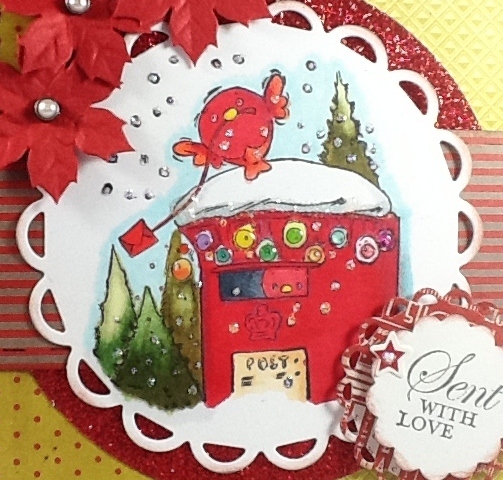 I stamped out the image and one of the sentiments bordered by the ornament stamp on each side. I colored them with my Spectrum Noir markers and then fussy cut the main image out and set it aside. I cut the sentiment into a rectangle and layered it onto some green and then some red card stock. I added some Glossy Accents to the ornaments and some Star Dust Stickles to the letters. Then I set it aside to dry. While it was drying I got started on my set of drawers card. 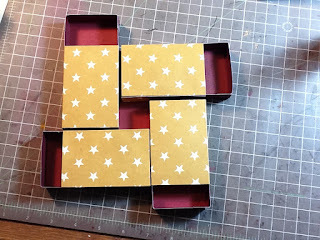 This project seems complicated but it really isn't that difficult to make. Why don't I walk you though it? First pull out your Ultimate Tool. 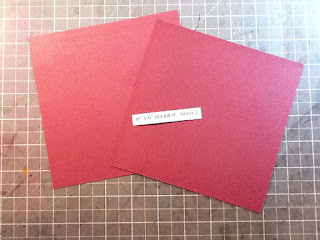 Next you will need to cut two 6" x 6" pieces of doubled card stock. 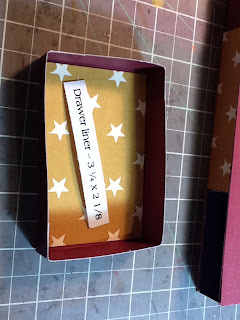 Doubling the paper just makes the set of drawers sturdier. Set these aside for now. Now to make the inner drawers you need to cut your paper 3 1/2" x 4 3/4". Take your Boxer board and put it between the notches on the Ultimate Tool. 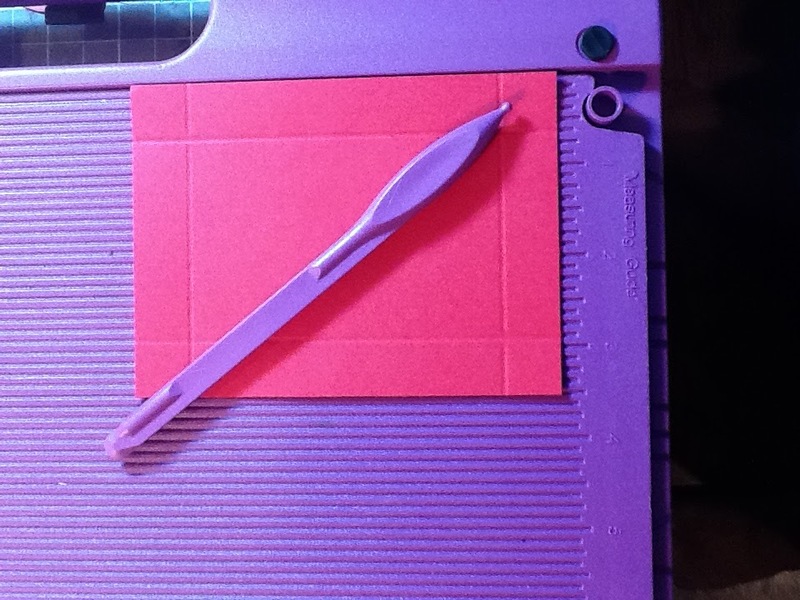 Align your paper up to the box lid side of the board (handle side). You will score the paper at 5/8" (5th line in) on all 4 sides of the paper. Next fold and burnish the folds. You will need to cut a "v" notch at each corner, flip the paper over and add adhesive to the notches. Then you would just fold up each side and tuck in each notch to make a box. To finish off this drawer you will want to make a drawer liner that will measure approximately 3 1/4" x 2 1/8". And also add a "handle" to the drawer front. 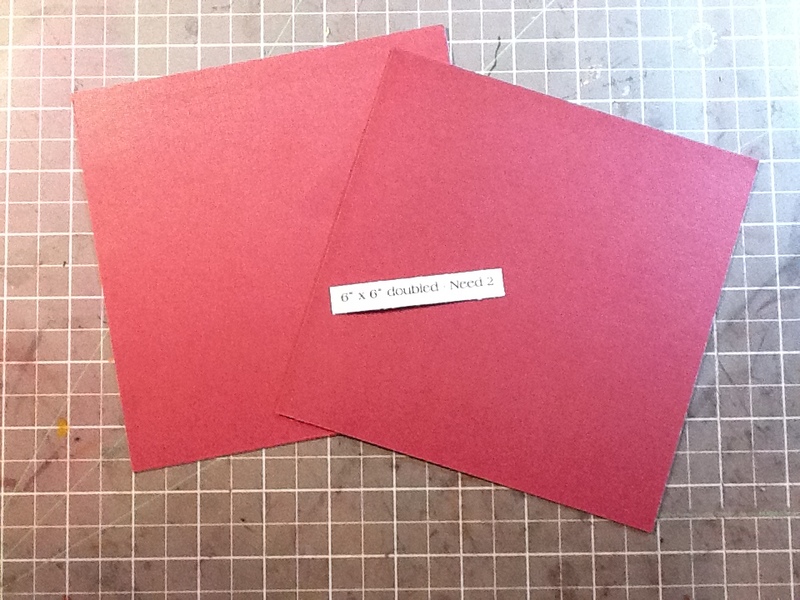 For my project, I cut a piece of card stock slightly smaller that the drawer front and adhered it to the drawer front. Then I added some holly with a berry brad as my handle. 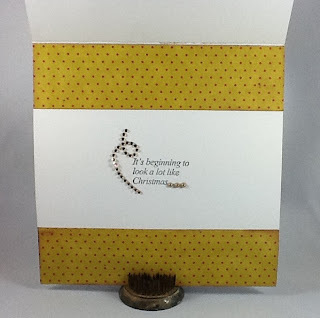 You could also use a small flower or a small ribbon bow as your handle. 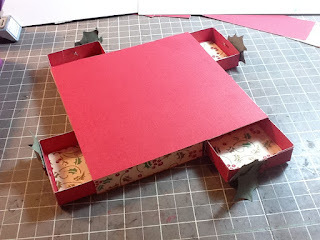 You will need to make 4 of these inner drawers. Now on to the slider which is the sleeve that the inner drawers fit in. You will work on the box base side of your Boxer board this time. Cut your paper 6 1/4" x 3 1/2". 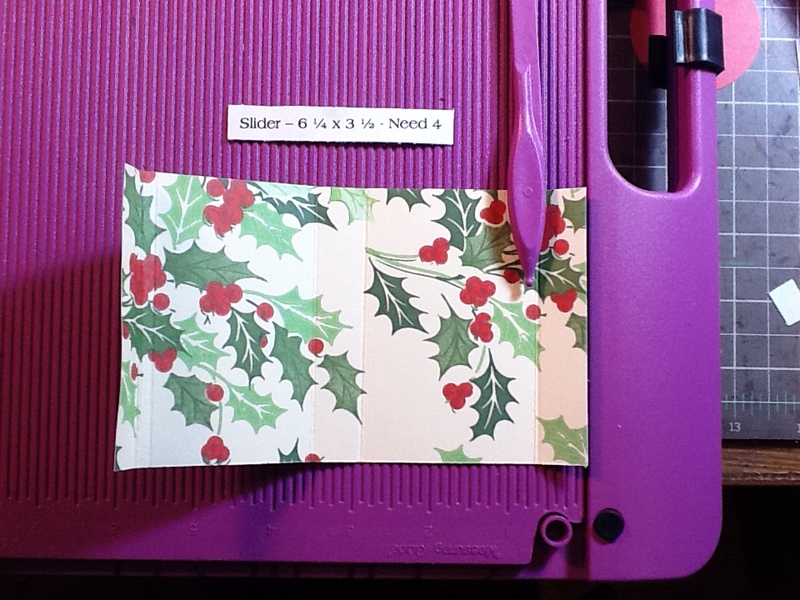 Line the short end of the paper (3 1/2" side) up to the hinge side of the board and score at 5/8" (5th line in). 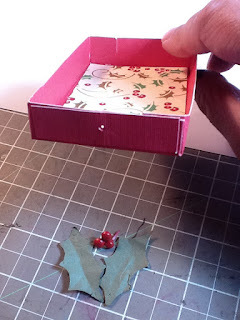 Fold and burnish, then line the folded edge up against the box base edge again and score at 2 1/4" (go to 2 inches and the go two lines past). Fold and burnish and place the folded edge up against the edge again and score at 5/8". Fold and burnish and line the folded edge up one last time. Now score at 2 1/4" again, fold and burnish. 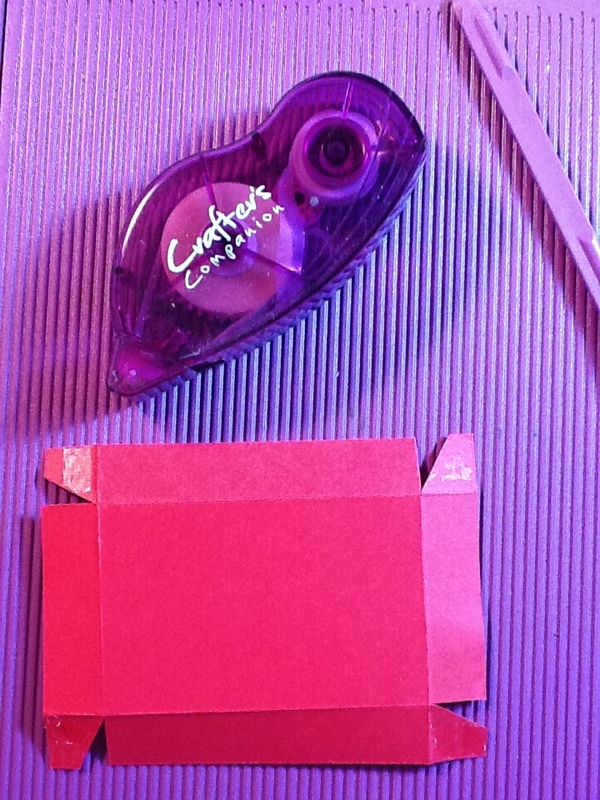 Flip the paper over and put adhesive on the last folded bit. Then you just turn it around and adhere the two ends together to make a sleeve. The inner drawer will slip right inside and fit perfectly. You will need to make 4 of these slider sleeves. ﻿Now to put things all together. Grab one of the 6" x 6" doubled papers to use as your base. Next you will adhere the 4 slider sleeves on top. Next you will adhere the second 6" x 6" paper on top. 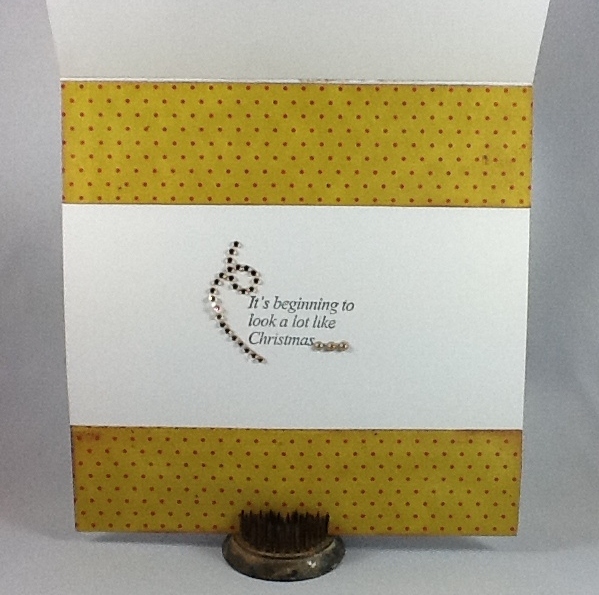 ﻿To finish things off I made an easel card to adhere to the top of the set of drawers. 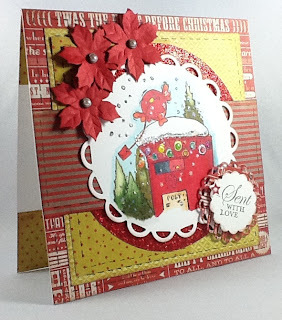 I layered complementary card stock with some patterned paper from my stash. 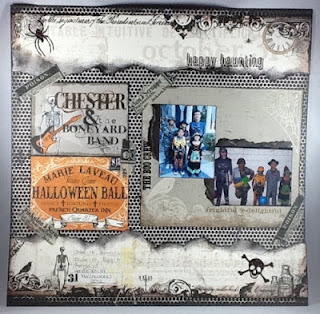 I used my Martha Stewart corner punch. I added some bling, some word stickers and a vellum embellie from my stash. 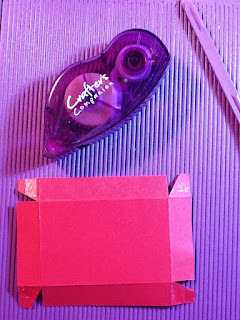 The last thing I did was use that stamped sentiment that I put aside earlier as my "stopper". I put double sided adhesive squares on the back to make it raise up off the page which provides the perfect edge to hold the card open in the easel position. ﻿I really am happy with how it turned out and I am so glad you stopped by to look. Until next time...happy scrapping.